The situation today, 31st. is exactly as per the forecast in MW-19. 2 days after Sri Lanka, the monsoon has touched Kerala on the 31st., and declared by the IMD too. Now, I repeat, the monsoon is weak, and should cover up the Karnatak coast in the next 2 days as a weak current. Now, regarding its further movement northwards along the west coast, I maintain the stand t hat it will be tardy till the 7th.of June. A weak W.D aloft is still raining sporadic showers in the north Rajashtan/Punjab/Delhi regions. 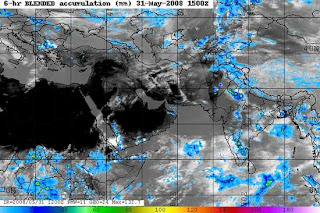 The image shows the rain areas on the 31st.May. The 200hpa jet stream is seen moving slowly north by almost all the forecast models , after the 4th. Also now, with the heating taking shape in the northern regions (though not to heat wave levels yet), the seasonal low has started forming and dropping anchor near the Pakistan/India border. COLA forecast shows a big "burst" of pre-monsoon thunder shower activity around Goa on the 3rd. The GFS forecasts also show pre-monsoon rain /thunder-showers creeping upto Mumbai by the 6th. That withholding, it can be estimated that the monsoon can reach Mumbai as per MW-18 estimate date of 9th.June. In the bay, I see the monsoon current dormant for another week. I had estimated earlier, that any activity in the bay would not reveive till after the first week of June. Well, the sst in the bay is still below normal, except near the head of the bay. On further heating of the waters we can expect some system to develop. Without a system in the bay, any major monsoon thrust is difficult. 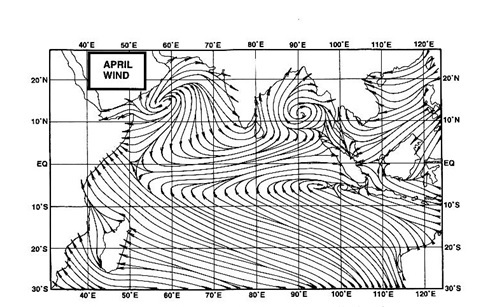 At the most, as the cross equatorial flows in the bay are strong enough even today, we may expect, again, a weak monsoon movement northwards from the bay islands towards the north-east around or after the 3/4 June. Kolkata can expect the monsoon only after the 9th.